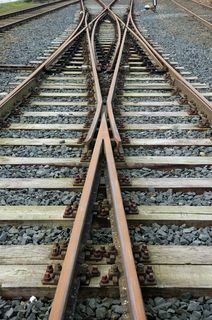 Turnouts, also known as switches and crossings (S&C), allow trains to move from one track to another, for example into a passing loop or at a junction. A railway vehicle traversing a turnout is subjected to several sources of excitation, including rail discontinuities and track irregularities. Variations in rail profile and wheel-rail contact geometry induce changes in contact conditions hence wheel-rail forces, giving rise to higher frequency excitations to the train/turnout system. Further excitations arise from the variation in bending and torsional track stiffness and inertia through the turnout, as a result of intended variations in the rail cross-section and sleeper size and unintended variations in subgrade support. The second Research Challenge is to design crossings and transitions so as to optimise vehicle behaviour through them, hence maximising resistance to damage. This requires a bringing together of a variety of techniques and disciplines from soil mechanics through materials and manufacturing to vehicle dynamics, in order to optimise the complex and non-linear relationships between the vehicle and track in a way that reduces track forces and hence track damage. It will require the development of simulation techniques for modelling the behaviour of railway vehicles running through track features with specific localised material, stiffness and geometrical properties. While some research has been carried out into adapting current codes for this, the approach requires substantial further development and high performance computing techniques. Incorporating the full 3D geometry, in contrast to conventional models which use a limited number of parameters to represent the track, will be a first; but it is the only way in which the potential for a designer switch, crossing or transition can be realised. incorporating the data and analyses into integrated cross-Programme models for improved track performance prediction and maintenance planning.